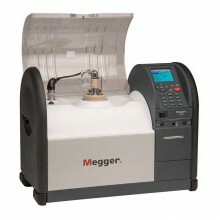 Includes: Vessel 400 ml assembly, Magnetic bead stirrers (2 off), Magnetic bead retriever, Feeler gauge set 1, 2, 2.5, 2.54 mm, OTS80 AF User manual, PowerDB Lite software. Please Note: The price shown is for the basic build only. The final price is determined by your choice of configuration. 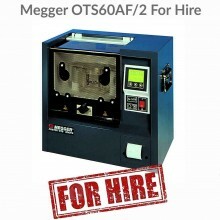 Example configuration: OTS60AF-UKU-P4 - This order is for a Megger OTS60AF with UK power lead, international electrode set, internal printer (fitted) and lid-mounted impeller. See PDF datasheet for details. 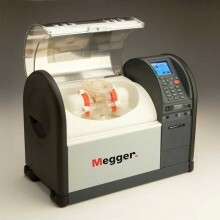 Megger’s OTS100AF/80AF/60AF Oil test sets are laboratory liquid dielectric breakdown testers. They are fully automatic, line powered and facilitate accurate breakdown voltage tests on mineral, ester and silicon insulating oils. 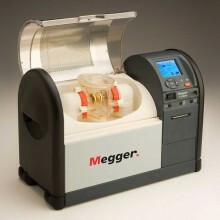 The precision test vessel sets the accuracy standard for the liquid insulation test industry. For ease of use the instruments come pre-programmed with a ‘library’ of international breakdown test standards and the ability to create custom tests. The instrument is housed in a metal case with moulded end caps that accommodate handles. The test chamber is designed with an easy-clean surface and provides a drain for spilt oil through an internal pipe routed to the rear of the instrument. A beaker or similar can be used for spillage collection. 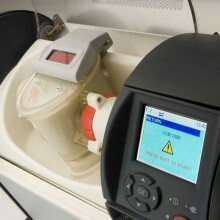 The test area is covered by a transparent lid with an electrically conductive screen which, with the metal case, provides a safe equipotential enclosure for high voltage testing. 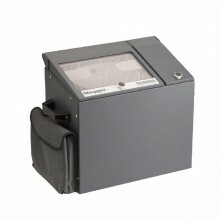 The lid allows in plenty of ambient light enabling users to confirm stirring and the witness breakdown. The chamber lid is dual redundant safety protected with micro-switches to prevent accidental electrification. 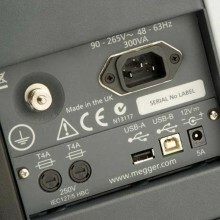 A zero volt touch bar at the entrance to the chamber enhances safety to for the user. 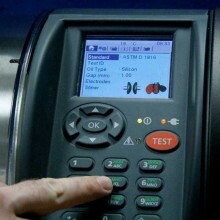 The precision test vessel design yields highly accurate and repeatable results. Two stirring options are available; an internal magnetic bean stirrer which is dropped into the oil and an optional lid mounted impeller that conforms to ASTM D 1816 requirement. Stirring during breakdown testing is used to produce an homogeneous distribution of contaminants within the oil and to free any carbon generated between electrodes during testing. All three laboratory models are fitted with a 12 key alphanumeric keypad to facilitate entry of test ID, filenames, notes etc. Alpha characters are entered by repetitive pressing on a key, the same way as text is entered on modern cellular telephones. Fully automatic breakdown tester with test voltages up to 100 kV/ 80 kV / 60 kV depending on model. USB barcode reader scans oil sample barcode labels. 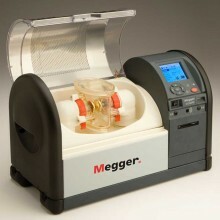 Megger Oil Test Set Product Video. Test voltage 0 to 80 kV rms maximum (40 kV - 0 - 40 kV). 0.5 kV/s, 2.0 kV/s or 3 kV/s depending on selected test standard. Rise time accuracy Better than 5%. Resolution and accuracy 0.1 kV ±1% ±2 digits. GOST 6581-75 | JIS C 2101-99 (S) | IS 6792-2. 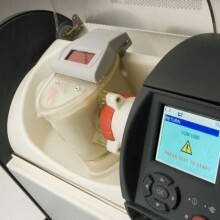 (IEC 60156 required oil to be within 15 °C and 25 °C). Temperature sensor resolution 1 °C . Display 320 x 240 QVGA colour display with backlight. Operating temperature range 0 °C to +50 °C. Storage temperature range -30 °C to +65 °C. CISPR 22, CISPR 16-1 and CISPR 16-2. Dimensions: 580 mm x 420 mm x 290 mm. Weight: 30 kg (with printer option fitted). 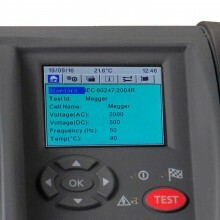 Megger OTS80AF warranty 1 year.